Tey Dhanyasthye Mahatmano ye Bhajanti Sada Sivam, Bina Sadaa Sivam yo hi Samsaaram tharthu micchhati, Samoodho Maha Papaha Siva dveshi Na samsayaha, bhakshitamhi garam ena Daksha Yagno vinaashithah, kaalasya dahanam eva krutam Raajyam pramochanam. (Those who perform ‘Bhajan’ to Sada Siva are worthy of commendation; who could possibly describe such Magnificent Bhagavan who devoured poisonous flames to save the Universe, destroyed Daksha Yagna, burnt off ‘Kaala’ and saved King Sweta from impossible hardships)! 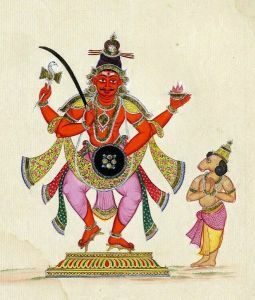 Sarvesham Yagnakartraanaam thvameva Pratipaalakah Saranayosi Maha Deva Sarvesham Praanino Prabho Raksha Raksha Maha Deva Putrashokena peeditham’. (My Greetings to You Lord Rudra, You are the embodiment of Peace, Parabrahma, Paramatma; You are the Creator of Prajapathies who create and thus You are the father of fathers; You are the Preserver of the Universe; You are the Supreme, the Blue Throated, Vedhasey, the Basic Seed, the Cause of Happiness; the Yagna, the Yagna Karma, the Super Organiser of Yagnas, the Omkar, the Vashatkar, I take refuge in You, kindly save us, be merciful and care for us the progeny of Yours). (Human beings pray to me for four end-uses, viz. to escape from the sorrow of wordly entanglements, to enquire about the purpose of existence, to fulfill desires and to genuinely seek me. Among these the best approach is indeed of a Gyani; others are all ‘Agnyanis’ or ignoramus only. Yagnas and such other Karmas without knowledge are imperfect ways of realising Paramatma; ignorant persons try to reach the Supreme Power Siva by reciting Vedas, perform charities or execute Yagnas and Tapasyas; these too are not the ideal means. The best way is to utilise ‘Gyan’ and perform ‘karma’with undiluted concentration and treat both worldly happiness and sorrows with equanimity). In other words, rituals are not necessarily the ultimate for seeking Salvation, but dedication and enlightenment are. This was indeed a lesson to Daksha who paid too much stress on rituals with disregard to devotion and mental regulation that landed him in his devastation but for Lord Siva’s clemency and forgiveness.